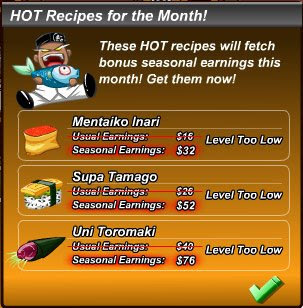 Its a new season in February 2009 and everyone's craving for the Mentaiko Inari (level 8), Supa Tamago (level 13) and Uni Toromaki (level 24) off our sushi stalls! With the insane demand, customers are paying almost twice as much for these sushis during this peak season and the sushi masters in Sushido are making a killing out of it! To top it off, we have also released the final magic skill, the Magic Roe! This item will be at almost half the usual price for this month only, get it fast! can we sell our item or skill back?